This collection of haiku, or short Japanese poems consisting of a single 17-syllable verse, includes a series of works compiled by Kawase Kiei and engraved by Yoshida Gyosen. The photograph presented here shows a work by Hanabusa Ikko. The combination of poetry, illustration and calligraphy, all adopting a common creative technique, contributed to the success of this fully-fledged literary form. Regarded as an autonomous genre conveying its own distinctive and integral manner of expression, the haikai emerged when poetry broke free from the restricted circle of the court to be practiced by all social classes including the bourgeoisie and peasantry. The work has a protective brown paper cover and is bound by means of a green cord strung through four holes. 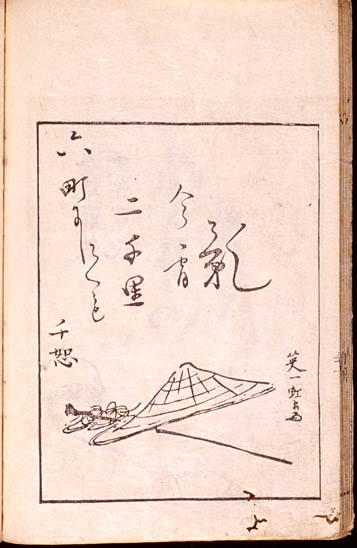 There is no title page but the first page features four Japanese vermilion seals.